How dull does that sound? Two words that just shouldn't sit next to each other. 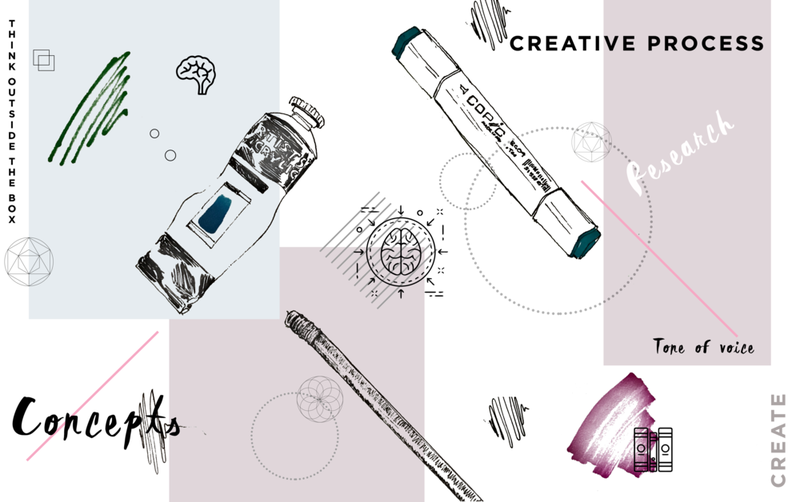 'Creative' the wild wonderings and world-changing thoughts that come out of great minds, and 'Process' a stale stagnant list of 'to do’s' that quash any creativity. Well, that's what I always thought anyways. It wasn't until I jumped my two size 7's straight into the working world that I fast found out that I needed something to cling onto and to guide me through a project. Hours sat staring at a blank Illustrator artboard can quickly awaken such a desire. University taught me how to be creative, how to think outside of the box and how to use creativity in a whole new way, but the practical tools for a successful career...not so much. Trial and error, a pinch of common sense and a whole lot of luck had to come into play to piece together a creative process. A process that today, I use for every single project. Everyone's process will be different, and it should be, you should have what works for you. And once you have one that you can trust a whole weight will be lifted. Here’s a little insight into how I work. It works for me, but is always evolving as each project teaches me a new lesson. There are no rights or wrongs when it comes to your process. PULL APART THE BRIEF - In whatever way a brief lands on your lap, whether within an email, spoken in a meeting or teased out over a phone conversation. I have to pull the brief apart, I have to question it, understand it and rewrite it in a way that works for me. Tip: Once you have a brief, your brain will want to jump straight to thinking of solutions, because as a creative, that's what you do. But don't. Acknowledge the ideas, but move them to one side. You need your mind to be as free as possible at this stage. INDUSTRY RESEARCH - Get to know your client, get to know how they work, get to know how their industry works, look at who’s doing it well, look at who isn't. Find the user, learn about them, get into how they think. VISUAL RESEARCH - Once I have a grasp on who I'm designing for, both client and end user I then flood my brain with visual cues. Colours, fonts, shapes, illustrations, layouts. This sea of inspiration soaks in and then a few styles and themes begin to float to the top. BUILD A MAP - From the research, I skim the cream from the top. With an informed mind, I start seeing a visual map forming itself in front of me. I print these out as moodboards to guide me through my designs. These boards hold the tone of voice and personality of the project. CONCEPTS - The dreaded blank page! It seems a little less scary now, you already have so many visual cues in your back pocket it’s natural to start sketching out ideas at this stage. I also know my process well enough now that the first few designs will be awful! But I still have to draw them out, to see them and then move on to the good stuff! In the concept stage, the designs should be quick. Never go into detail at this point, visualise it, is it working? Yes, ok come back to it later. No, ok, let's move on! SHARE - Share with your colleagues, share with the client, don't be afraid to share early. There is nothing more heartbreaking than investing your energy in a design only to show it to someone and they tell you it's not working. Tip: Refer back, look at those thoughts, feelings and visual cues that you collected at the beginning of your process. Is what you're doing now still true to that vision? If not, why not? Maybe you were right to move away...but make sure that reason is good enough. DEVELOPMENT - Hopefully from your concepts you and your client will have whittled them down to a few strong contenders. Now step back from it. Or even better, give it away! I'm lucky enough to work really closely with my business partner and fellow designer, Sally, so often in the development stages, we'll swap designs. We'll work on each other concepts which instantly removes any subjective attachment that you'll have for it. We know each other well enough to trust that we'll do good by the other person's design too! FINAL DESIGN - The final piece of the puzzle. Having a process doesn't stamp out creativity, it just becomes a guiding light, that the more you use, you begin to trust will always get you to your end destination. What you do in between these points is entirely up to you, but if you find yourself going a little off track, trust in the process safety net.